It’s that time again already: your website needs a reboot. Just thinking about it makes you wince. All that change can be painful and expensive – traditionally it takes several months to sort out a website re-design and marketing campaigns, and you can’t always be sure the new site will offer a better UX or generate higher conversions. In fact, it might go the other way. Surely there must be a better approach? One that involves less risk and expense? Thankfully, there is. It’s called the Growth Driven Design (GDD) model. GDD does things differently. Instead of a major website redesign process every two years with little change in between, GDD develops your website bit by bit, using a series of Agile sprint cycles to improve features and content in response to user data. There are lots of advantages to trying the GDD approach. It takes less time to see results and costs a fraction of a total rebuild. Because each iteration is based on an analysis of customer data the outcome is more predictable and more likely to be successful. GDD changes the focus of website redesign from a fixed outcome to continuous learning and improvement. Because you can achieve an initial rebuild in weeks rather than months, it also delivers a high return on investment, fast. Implementing GDD means changing your whole approach to your website and your marketing campaigns. To find out how to roll out GDD in your company, read about its four main principles below. 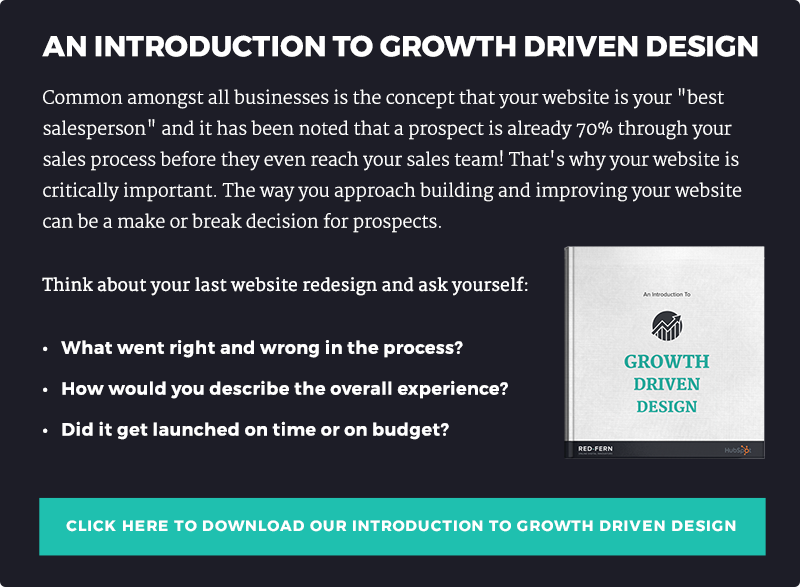 The Growth Driven Design process starts with an audit of your company website. Using automated software, establish how your current users interact with your site, how they arrive there, and the reasons why they’re bouncing or dropping off. The results of the audit will give you a clear understanding of how your website is performing and will highlight opportunities to improve your UX on the new site. It will also clarify why people visit your site, the value proposition they receive there and which devices they use to navigate around. Even at this early stage, your developers should work closely with your sales and marketing teams to compare assumptions about UX and the customer journey with data gathered during the audit. This is a valuable opportunity to learn how successful your marketing and sales techniques have been. Once the initial audit is complete your teams can identify areas for improvement. Create a wish list of the features that will increase the performance of your site. Carry out a ‘nice to have’ vs ‘must have’ analysis to figure out what to focus on first. As you whittle things down the core purpose of your website will become clear, giving you a strong starting point for your initial site redesign. Once the key messages and content of the new website have been agreed, your developers can start work on the initial redesign, including its information architecture, wireframing and design, programming and development. During the first sprint, they should set up UX data collection points as they go, creating live test pages to monitor UX data as it comes in. This data should be regularly checked to make sure the redesign is heading in the right direction. After the first sprint cycle (somewhere between 4 and 8 weeks), launch your redesigned site so that you can collect user data on the improved features. This will inform the next stage of the GDD process, where you measure the effects of your redesign against your performance goals. Because GDD is a continuous process, you can come back to anything that wasn’t included this time in future sprints. This way you build on your successes gradually, but with a more evidence-based approach. The data element is key – it shows you how users respond to your website design and what you can do to improve things. By now, your end users are the focus of everything you do. The data you have gathered during the first sprint cycle will help your teams to see how your site’s design and content impacts on the UX, customer journey and conversion rate. This analysis impacts your website marketing because you can now see which content is most effective at generating leads. Because you can closely track your users’ behaviour on your site, you can use the insights from the audit and sprint cycle data to develop targeted marketing campaigns that will drive traffic to your new web pages. Once you’ve set up these new campaigns, you can compare your performance with your goals for the re-design. The data from these experiments will either validate or kill your previous assumptions about your UX and customer journey. Armed with this information, you can tweak the content and design of your site to get even closer to achieving your revenue goals. It’s important to share these results widely within your company to inform and educate others, and then use any feedback as a focus for the next sprint cycles. The final principle of the GDD model is the one that has the most lasting effects. Rather than stopping once your initial results have been achieved, your website continues to improve through further sprint cycles. This ongoing development enables your company to create more opportunities for conversions, UX improvements, personalisation and marketing assets as they are needed. Because your site redesign is based on continual data analysis, you can make evidence-based decisions on which changes provide the best return on investment (ROI). With a greater focus on UX, your design and marketing will become more responsive to your users’ needs, delivering greater number of qualified leads that convert into sales and revenue. We’re excited about the potential GDD has to revolutionise online business.